Let’s talk about the season-opening contest between the New York Giants and the Carolina Panthers, the first NFL game at the new Meadowlands Stadium. We’ll talk about it from an on-field perspective and from a fantasy football perspective. The Giants won a mistake-plagued game 31-18. *The Giants are now a deep-passing team. The offense struggled to be efficient running the ball, but via the pass Eli Manning hit some big plays to Hakeem Nicks (including two long touchdowns), Mario Manningham, and Steve Smith. That’s not the way the Giants have traditionally played, but the way the Giants have built their team has enabled this to be the best way to move the ball. *The Panthers’ offense moved at times with QB Matt Moore, but Moore also showed a lack of accuracy and poor decision-making. Moore threw three interceptions, and both of his second-half picks were of the blatant variety. *The Panthers’ defense looked stronger up front than it was last year, despite the losses of stalwarts like Julius Peppers, Maake Kemeotau, and Damione Lewis. The front four is deep and young, and those guys make plays. It showed not just in pass rush but also in the way Carolina locked down the Giants’ running game in the first half. *At linebacker, the Panthers are playing without Thomas Davis, but that injury has put Dan Connor into the lineup at middle linebacker. Connor can make some plays, as he proved with a first-half sack. He and Jon Beason are something to build around at that position. *While the Panthers’ unheralded defensive front seven stepped up, Carolina’s pass defense struggled. Although FS Charles Godfrey two interceptions off tipped balls, he appeared to drop some assignments that led to big plays in the first half. *The Giants’ pass rush needs to be back in full force this season if the team is going to contend, but the front four didn’t generate much pressure in the first half. In the second half, though, the Giants figured out how to get to Matt Moore, especially when the Panthers were in last-ditch-effort mode in the fourth quarter. 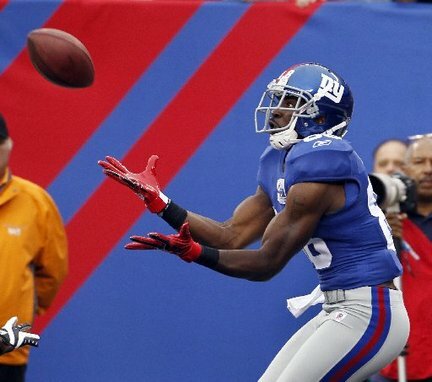 *The Giants’ secondary had three interceptions, including one by CB Terrell Thomas, who had a terrific game. Thomas looks to be an aggressive corner who can be a great fit in press coverage. *Panthers rookie DE Greg Hardy is a player, and the punt he blocked in the fourth quarter that resulted in a safety and his forced fumble later in the period are a sign of things to come for this impressive sixth-rounder. *I’ve never seen a facemask like the one Giants DT Chris Canty wears. He must really not like being poked in the face. *While the Giants have a deep receiving corps, Nicks is the player most likely to catch a deep pass. It should be no surprise that Nicks was on the receiving end of two long touchdowns in the first half. He looks like he’s moved into being a starting-caliber fantasy receiver in all leagues. Meanwhile, WR Mario Manningham (who had four catches for 85 yards) looks like he’s still going to have a pretty significant role and should be owned in leagues of 12-teams or more. *New Panthers QB Moore isn’t going to put up monstrous numbers, and his turnover tendency in this start is distressing, but he’s proficient enough to help WR Steve Smith maintain his fantasy value. Smith is still a pretty safe bet to have 75 yards receiving most weeks, as he did in this one, and he’ll catch his share of touchdowns as well. *Both Ahmad Bradshaw and Brandon Jacobs got their share of carries for the Giants, but it’s clear that Bradshaw’s role as a starter will mean he gets more touches. While the numbers weren’t there for Bradshaw in this game, going forward he retains far more fantasy value than Jacobs. Bradshaw had the longest run of the game, a 39-yarder, and also had a goal-line touchdown. *With the Giants relying on their deep passing game more this season, Manning is going to make a run at the bottom half of the top 10 among fantasy quarterbacks. His production may be a little up and down because of how boom-and-bust long plays are, but Manning will have his share of long TD passes to buoy his fantasy stock.